Sheep exist in astonishing variety beyond the typical concept of “fluffy white sheep in a field.” I had a notion to make something unusual, but nevertheless real. So I researched rarer breeds, and settled upon the Balwen Welsh Mountain sheep because I really like their markings. Prior to research, I’d never heard of this breed. They originated in the British Isles, particularly in Wales. 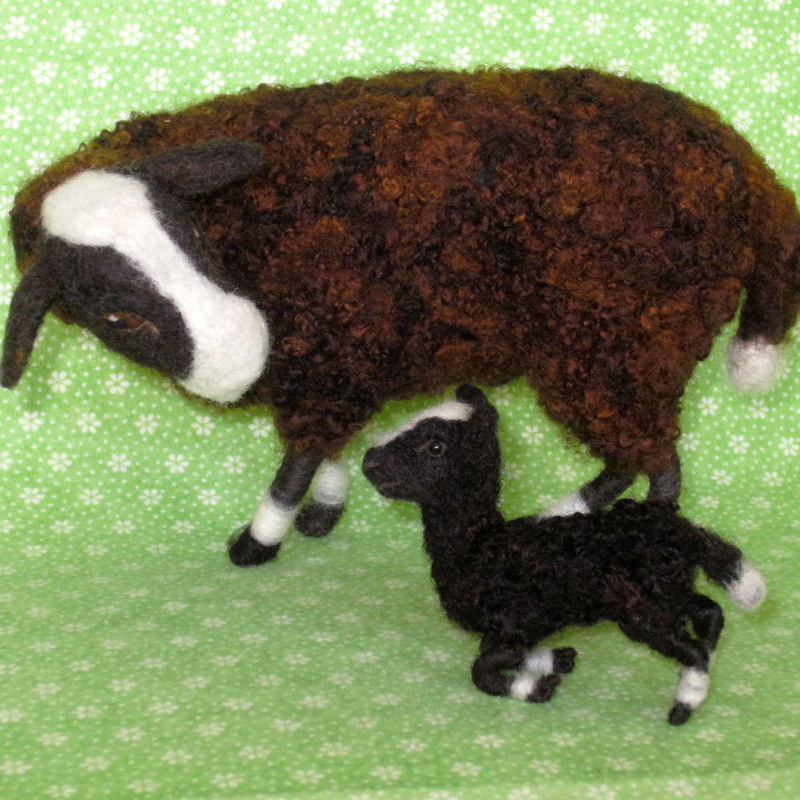 Here I’ve chosen to create a ewe with her newborn lamb, ready to nurse. 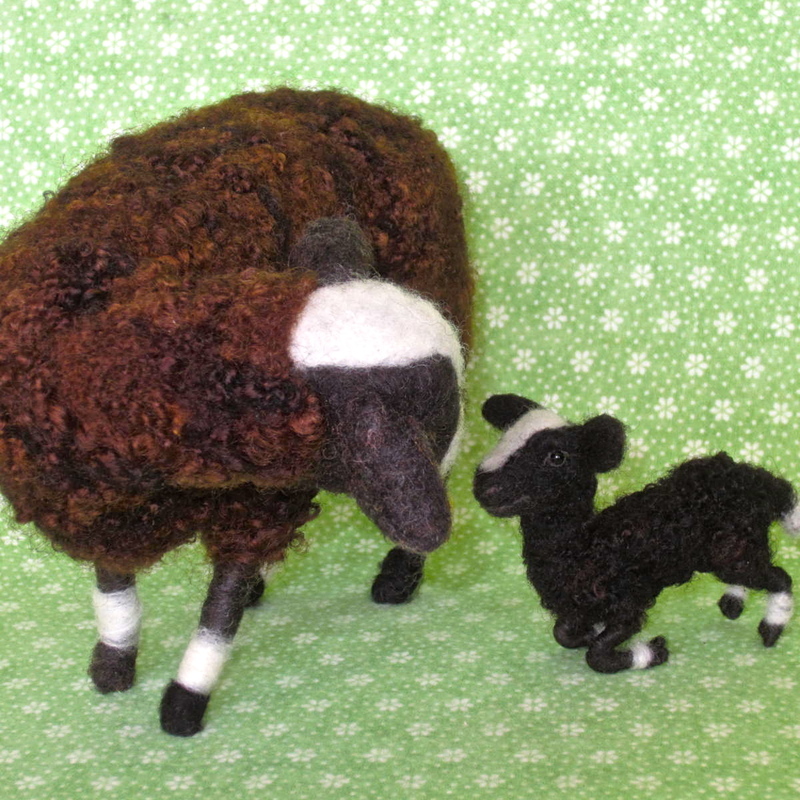 The Balwen sheep are born black, their fleece later fading to brown in sunlight. It has a white blaze on the face, four white feet (referred to as socks), and white covering the last half or more of the tail – which is normally left undocked. 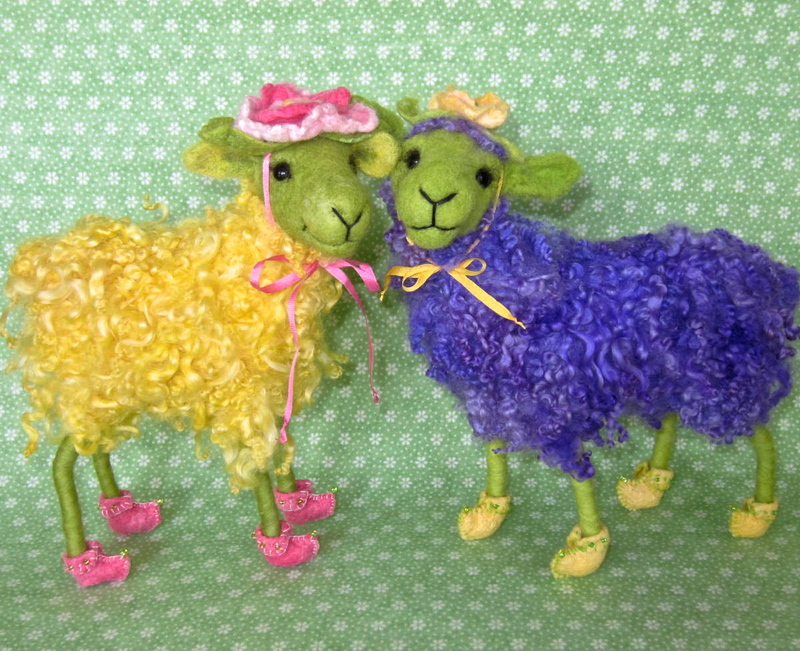 Now before things get entirely too serious…..the magical sheep reappear in a silly parade of Blooming Ewes sporting their colorful finery. From floral bonnets to striped stockings and beautiful booties (of the footwear sort!). (Ps. they are bright for sure, but not neon, like I suspect my monitor is showing me). Appearing soon at Black Sheep Gathering 2013. Come see us! How does one purchase one of these whimsical sheep and what size are they? Please excuse my late reply – due to being on long sabbatical to prep & sell a house (mission accomplished & I’m ba-ack). My creations are sold only at local wool festivals in the Portland Oregon area, where we have a large & lively fiber community. Large enough that I can scarcely produce enough to fill each show booth and never did manage to populate an Etsy page. Good thing, because Etsy is open 24/7 year round, and I’m just trying to keep up with shows every few months. 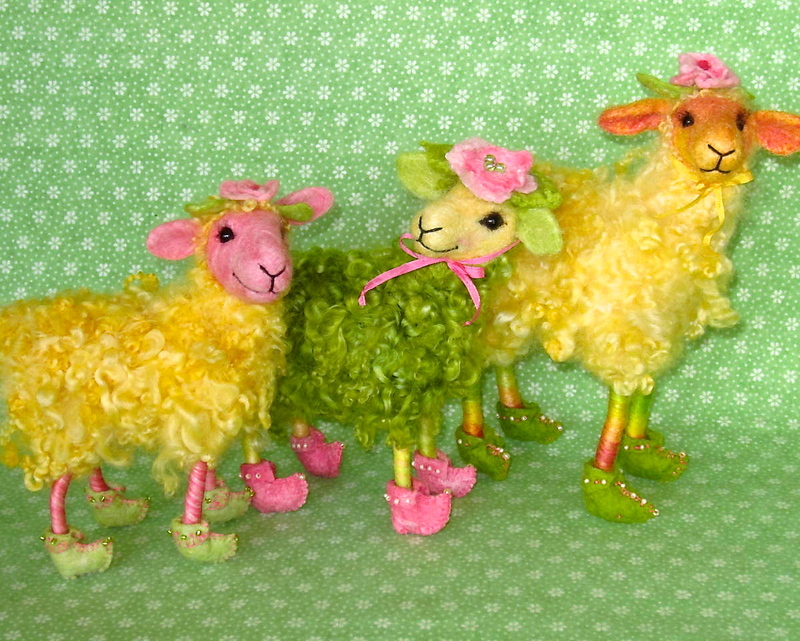 The sheep tend to be about 5 ~ 6″ long, and about 6 ~ 7″ tall. There are exceptions. The Blooming Ewes are larger by a few inches. Having just resumed production after a very long absence, I am also creating some miniature sizes. As always, new ideas appear alongside now staple favorites.